Raise a stein, it’s a taphouse! Michael Rosenstein and wife Jan Faletic are excited to open their Stein’s Taphouse and Wine Bar, which will offer exclusive selections of local and interstate craft beer, wine and spirits at Provenance Barossa, Beckwith Park. This article was published by the Barossa Herald on Monday 11 April 2016. What was once an old Penfolds wine laboratory, is now being transformed into a hotspot for craft beer and boutique wine lovers. The newly developed Stein’s Taphouse and Wine Bar, will be the first place in the Barossa to offer exclusive selections of local and interstate craft beer, wine and spirits – and is expected to open its doors early next month. Located at Beckwith Park, the new business forms part of Provenance Barossa, which is visioned to become a “vibrant tourist destination” and already includes Penfolds, artisan coffee roasters Bean Addiction and First Drop Wines Home of the Brave. 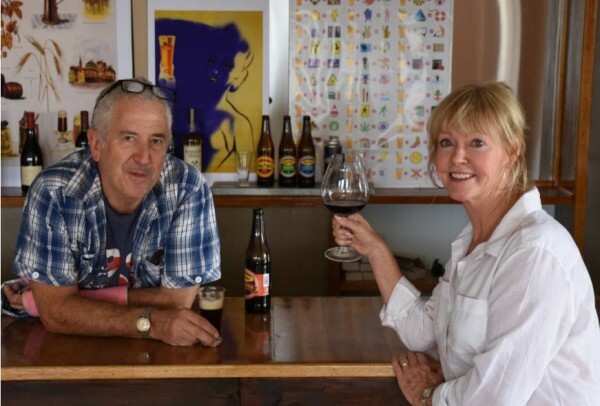 Owners Michael Rosenstein and wife Jan Faletic moved from Victoria to the region last year to start their own taphouse, which the pair believe is the “missing link in the jigsaw puzzle in the Barossa”. “It’s a completely different experience to what pubs are offering,” Mr Rosenstein said. “There’s some fantastic fine dining and some world-class wineries, but broadly speaking there’s nowhere to taste craft beer. The taphouse will feature 12 of the “best” craft beers on tap, a further 50 bottled beers, along with boutique wines and spirits, however the beverages will constantly change to “reflect the season”. “We are going to sell exclusive Australian spirits, because the big buzz word at the moment is ‘distilleries’,” Mr Rosenstein said. The pair started their new business venture after returning from America, where they visited a number of wine bars and taphouses. “Beer has gone nuts in America and it’s not about the mainstream beers – it’s about craft beers,” Mr Rosenstein said. “We were just blown away by the popularity of craft beer – by males and females equally. – Article written by Laura Eckert, Barossa Herald Newspaper.